Scorpio Someone or something could upset you this week. You prefer to crawl away but that doesn't get you anywhere. Don't simply put the advice of other people aside though. It's wiser to be respectful for the opinion of your loved one even when this is completely different from yours. Accept that you can't always be right and that two heads are better than one. Whatever your endeavors are this week, too much stress will make you feel restless and act on impulses. This will create even more tension not only in your professional life but on your personal life as well. Make sure you force yourself to relax. Scorpio You are a humble soul, Scorpio. You are there for your loved one and your friends when they need you and that gives you a beautiful place in their hearts. People appreciate you for your loyal efforts and that stimulates you to add some extra. That's not necessary though. The best way to help others is to teach them how to fish. You're looking forward to some busy days this week. Make sure you blow off some steam and recharge that battery. Allot the entire weekend solely for rest and recreation. Scorpio A romantic flirt makes you feel a bit doubtful. This person might not be as free as he/she pretends to be. Be alert and don't let your hormones lead you, Scorpio. Use your intuition to read the other party's true motives. The potential for success lies in teaming up with someone. Together you will accomplish something big. Your forte is to direct the energy more efficiently. If you're going shopping this weekend, that new fashion trend suits you perfectly. Decide what you want and go for it. Avoid impulsive purchases that you'll regret later. Scorpio Beauty and love are essential elements to you so focus on them Scorpio. It's also time to reconnect with old friends and relatives. Cherish important friends and ask them for help if you need it. They are happy to help you out. An event this week can cause a dent on your self-esteem. Don't worry because that's easy to repair. If you're into sales or business, eliminate your opponents out of your social network. Sharing your ideas is fine as long as you choose the right audience. A weekend away would be a good idea. This getaway is meant to relax not to stress out. Scorpio You know exactly what your loved one desires from you and what you have to give to find the right balance. If you're single, you will suddenly have the courage to speak to the one you like. Unfortunately, that won't be the case at work. You are being encouraged to take things easy for a while even though you are a very zealous person. Divide your chores and delegate as much as possible. The last thing you want is to feel exhausted at the end of the week. 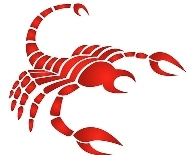 Find out about the Scorpio love horoscope and famous Scorpio celebrities using the link above.